I had a battery that came up to about 11.2V and later dropped to 9.x. No amount of coaxing has done any good. The inventor says it has a dead cell and would sometimes do that. Dang, it was looking good for a while. No huge loss, it was a battery in physically good shape that I found. I've had some success with this unit. The first (12 V 4 Ah) two batteries could not be desulfated because the voltage on them was too low. I could not get them to take a charge either to be brought up to the level where the BatteryMinder would desulfate them. What you can do is hook a 12V source up in parallel to the 'bad' battery and the BatteryMinder (let's call it BM because it's too long to type) and then it will work. The BM has to see something like 10.2V before it will desulfate or charge. I clipped the BM alligator leads to the battery, and then clipped a car charger on 2A rate to those leads. (+ to + and - to -). I let it sit for a few days on and it came up some, 8-10 volts or so. They were initially in the single digit range. After that I placed it on the 2A charge rate with the car charger and now the batteries are up to 12.3V and have been sitting there for days. I plan to place these back on the BM in the near future. It's working on some 12V 7Ah batteries in the garage for now that merely had a reduced capacity but would still drive a Razor E100 for a few blocks. Q: Can it revive a battery with a low capacity but still 12 or so volts? A: Typical scenario. Qualify it by charging and letting it sit to see what resting open circuit voltage is. 12.8 would be a good battery. Over 12-12.5 is a good candidate. Q: How long does it take to rejuvenate a battery? A: 72 hrs for a battery that is not in parallel. Check it after 72 hr charge, let it rest overnight, and look for 12.8V. Look for improvement after another 72 hr period if it's not 12.8V. Some batteries have taken two weeks to come back. Q: Is it ok to 'fake' a 12V signal by putting a good battery in parallel with a 'bad' (heavily sulfated) one? Q: Is it equally effective for a sealed gel cell battery? A: As long as it is lead acid, it works equally well. Q: If you are desulfating in parallel, does wire lead size matter? A: 10-12 guage would be best, less is ok for a short run. More batteries in parallel splits the signal up and takes longer. Thanks to Bill White for those answers! 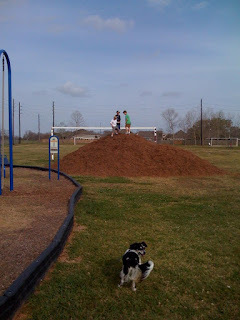 Giant wood chip piles are AWESOME!